Like so many other quilt blocks, the Single Irish Chain has been known by other names. Each block is very simple, but when connected the patchwork links with each other to create color flow along both diagonals. Fabric can be sewn together one piece at a time, but assembly is faster when the quilt block is strip pieced from rotary cut strips of fabric. Cut longer strips of fabric if you plan to make additional blocks. Use a quarter-inch seam allowance throughout. Sew a dark narrow "A" strip lengthwise to the wider light "A" strip. Press the seam allowances towards the dark strips. Sew a light narrow "B" fabric strip lengthwise to each side of the wider dark "B" strip. Press to set the seams and then press the seam allowances towards the dark strip. Sew an "A" segment to the top of a "B" segment, matching seam intersections carefully. Press seam allowances towards the "B" segment. Sew a second "A" Segment to the bottom of the same "B" segment. Press seam allowances towards the "B" segment. Repeat to make three more Single Irish blocks. Press and measure. Your block should be 1/2" taller and wider than its finished size. It's easy to make a baby quilt by combining Single Irish Chain quilt blocks with large squares of fabric or other quilt blocks of the same size. Pre-printed fabric panels. like the partial example of a quilt shown, sometimes offer perfect designs for a baby quilt. A four or six-inch finished quilt block is a good choice for baby quilts and works with many of the square motifs on pre-printed panels. Use the instructions on pages 1 and 2 to construct the quilt blocks. You'll need additional Single Irish Chain quilt blocks so cut your fabric strips from selvage to selvage instead of using the shorter lengths given for four blocks. Cut as many segments as you can from each longer strip set and assemble blocks as shown. Make additional strip sets as needed. 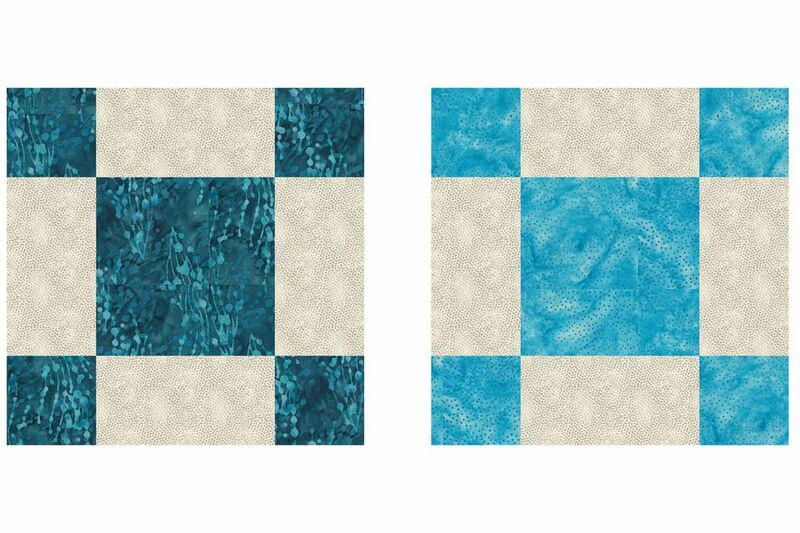 Cut alternate blocks from any fabric of your choice or from pre-printed panels. Cut 4 1/2" squares to use with 4-inch finished blocks; cut 6 1/2" squares to use with 6-inch finished blocks. Create rows by sewing your alternate blocks between Single Irish Chain quilt blocks as shown, alternating block types from row to row. Press the seam allowances towards the alternate blocks. Sew rows together and press. Always use straight pins to keep fabrics in place. Add straight borders or borders with corner squares to the quilt if you like, and then finish the quilt.